For more information about this Proven Safety Countermeasure, review the Office of Safety's Local and Rural Road Safety Briefing Sheets. of the Interstate Highway System. A local road safety plan (LRSP) provides a framework for identifying, analyzing, and prioritizing roadway safety improvements on local roads. 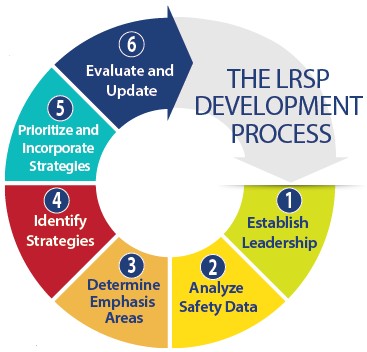 The LRSP development process and content are tailored to local issues and needs. The process results in a prioritized list of issues, risks, actions, and improvements that can be used to reduce fatalities and serious injuries on the local road network. While local roads are less traveled than State highways, they have a much higher rate of fatal and serious injury crashes. Developing an LRSP is an effective strategy to improve local road safety for all road users and support the goals of a State's overall strategic highway safety plan. Stakeholder engagement representing the 4E's â€“ engineering, enforcement, education, and emergency medical services, as appropriate. Collaboration among municipal, county, Tribal, State and/or Federal entities to leverage expertise and resources. Identification of target crash types and crash risk with corresponding recommended proven safety countermeasures. Timeline and goals for implementation and evaluation. Local road agencies should consider developing an LRSP to be used as a tool for reducing roadway fatalities, injuries, and crashes.1 The plan should be viewed as a living document that can be updated to reflect changing local needs and priorities. 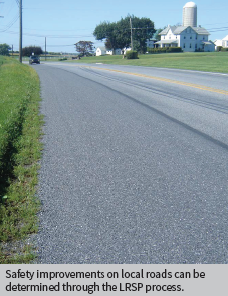 1 Developing Safety Plans: A Manual for Local Rural Road Owners, FHWA-SA-12-017, provides guidance on developing an LRSP.